Reading and share top 13 famous quotes and sayings about Sweetness Of Life by famous authors and people. Browse top 13 famous quotes and sayings about Sweetness Of Life by most favorite authors. 1. "Now therefore, while the youthful hueSits on thy skin like morning dew,And while thy willing soul transpiresAt every pore with instant firesNow let us sport us while we may,And now, like amorous birds of prey,Rather at once our time devourThan languish in his slow-chapped power.Let us roll our strength and all Our sweetness up into one ballAnd tear our pleasures with rough strifeThrough the iron gates of life:Thus, while we cannot make our sunStand still, yet we will make him run." 2. "And there, surrounded by death above and below, he sticks his tongue out and tastes the sweetness of life." 3. "Oh Woman, come before us, before our eyes longing for beauty, and tired of the ugliness of civilization, come in simple tunics, letting us see the line and harmony of the body beneath, and dance for us. Dance us the sweetness of life. Give us again the sweetness and the beauty of the true dance, give us again the joy of seeing the simple unconscious pure body of a woman. Like a great call it has come, and women must hear it and answer it." 4. "Love is always ready to deny itself, to give, sacrifice, just in the measure of its sincerity and intensity. Perfect love is perfect self-forgetfulness. 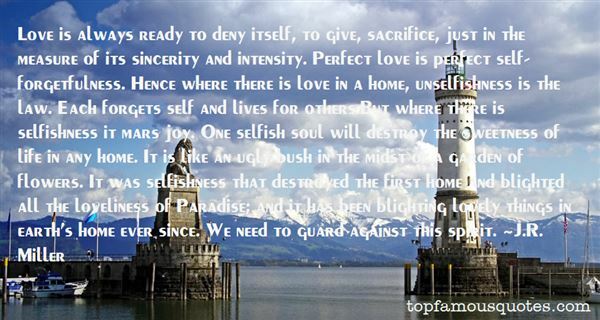 Hence where there is love in a home, unselfishness is the law. Each forgets self and lives for others.But where there is selfishness it mars joy. One selfish soul will destroy the sweetness of life in any home. It is like an ugly bush in the midst of a garden of flowers. It was selfishness that destroyed the first home and blighted all the loveliness of Paradise; and it has been blighting lovely things in earth's home ever since. We need to guard against this spirit." 5. "Just in case you thought elephants were all sweetness, I can attest to the fact that this one had the time of her life scaring the bejeezus out of those dudes." 6. "Underneath his sweetness and gentleness was the heat of a volcano. [Michael Faraday] was a man of excitable and fiery nature; but through high self-discipline he had converted the fire into a central glow and motive power of life, instead of permitting it to waste itself in useless passion." 7. "The sweetness and generosity and politeness and gentleness and humanity of the French had shown me how lovely life can be if one takes time to be friendly." 8. "Coffee is a lot like people. In many ways, it's deceiving. The sweetness that you smell as it brews is more often than not a fallacy. The scent of a dark roasted coffee bean promises you rich flavors with hints of chocolate and hazelnut, but if you're not used to coffee's deceptiveness, you're left with a bitter aftertaste dangling at the back of your throat. To those of us who are used to it- we've grown a fondness for that bitter taste. It's complex. It's teasing. It reminds us that most things in life are not consistently sweet with every sip. One morning, your coffee might brew mild with just a flirtation of nutty undertones, And the next morning, it might be pelting you in the face with those same nuts, leaving little stinging marks with each sip. It's moody. It's not easy to perfect. But when you get the perfect brew, it's rewarding. And that same perfection is not guaranteed tomorrow just because you managed it today." 9. "Sweetness eliminates gravity and thus a man with a heavy burden of life starts feeling like floating in the air before sweetness." 10. "The third week of June, and there it is again: the same almost embarrassing familiar breath of sweetness that comes every year about this time. I catch it on the warm evening air as I walk past the well-ordered gardens in my quiet street, and for a moment I am a child again and everything before me - all of the frightening, half-understood promises of life." 11. "The days aren't discarded or collected, they are beesthat burned with sweetness or maddenedthe sting: the struggle continues,the journeys go and come between honey and pain.No, the net of years doesn't unweave: there is no net.They don't fall drop by drop from a river: there is no river.Sleep doesn't divide life into halves,or action, or silence, or honor:life is like a stone, a single motion,a lonesome bonfire reflected on the leaves,an arrow, only one, slow or swift, a metalthat climbs or descends burning in your bones." 12. "For love is a willful stirring of our thoughts unto God, so that it receive nothing that is against the love of Jesus Christ, and therewith that it be lasting in sweetness of devotion; and that is the perfection of this life." 13. "In the Cross is salvation; in the Cross is life; in the Cross is protection against our enemies; in the Cross is infusion of heavenly sweetness; in the Cross is strength of mind; in the Cross is joy of spirit; in the Cross is excellence of virtue; in the Cross is perfection of holiness. There is no salvation of soul, nor hope of eternal life, save in the Cross." She is…" Death turned her head, considering. "She is like a party dress I wear when I want to impress visiting dignitaries. Like your friend Betsy, I too am a Terrible Engine. I too have occasional need of awe. But between us, I think, there is no need of finery."